If measuring by sheer numbers of Amish, Branch County, Michigan is well behind Lagrange County, Indiana just to the southwest. Yet in another way Branch County is quite the “Amish County” – home to 5 separate Amish settlements, some of whom are very plain. The oldest, lying in California Township, has been around nearly six decades. So this is a community where non-Amish people have long lived alongside an Amish presence. 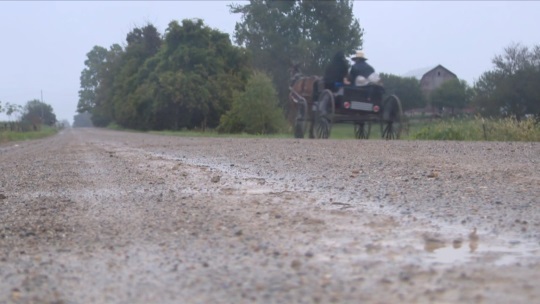 COLDWATER, Mich. — There are growing concerns about deteriorating road conditions and deadly crashes involving Amish buggies and horses in West Michigan. The Branch County Farm Bureau passed a resolution in the hopes the Michigan Farm Bureau will convince lawmakers that something needs to be done. Outside the town of Quincy, a stretch of Lester Road in Algansee Township has plenty of wear and tear. “It’s detrimental to your vehicle and it’s dangerous too,” said a resident. The damage is so bad, parts of the road converted from pavement back to dirt. Local leaders say horse and buggies used by this local Amish community play a big role in the destruction. “We spend too much money on our roads to have steel wheels and carbide-tipped wheels tearing them up,” said Michigan Sen. Mike Shirkey, R- Clark Lake. …annual licensing of horse drawn vehicles used mainly on public roads and require each buggy to be marked with reflective devices making our roadways safer for all involved. The resolution also urges that rubber shoes and wheels be required for all horses and vehicles. 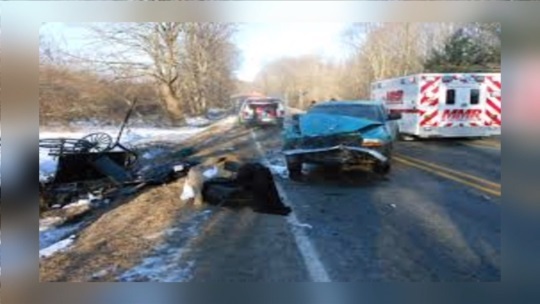 Over the past year, the state has seen at least two serious accidents, one of which resulted in the deaths of three children. The goal here is to get a statewide law passed along the lines of those regulating buggies in other states like Pennsylvania and Indiana. 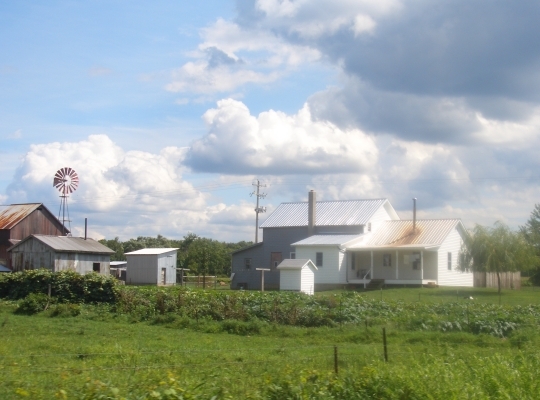 The Amish settlements of Branch County are not all the same, as I detailed in this post following my visit to the county in 2011. The Amish in the Quincy settlement in the north end of the county are less plain, with buggies having lighting and safety markings. However it seems that they are also considered culprits here as the Quincy area is noted in the piece. I’d suspect the proximity of the nearby Lagrange settlement has had some influence on this move. These Amish there drive among the best-lit of all buggies, and are quite integrated with the local non-Amish community. They are also among the few Amish nationwide whose buggies carry license plates, a source of revenue for the local government. Casting their eyes south at the Amish driving licensed, well-illuminated carriages which are not only ostensibly safer but also a sense of revenue, and you can imagine the people in charge in Branch County seeing them as a model of how things could be. However that would require the Amish to go along with the change. You’re essentially weighing the pain and cost of moving against the added financial cost and, more importantly, moral dilemma of accepting change brought upon you from outside. I imagine some of Branch County’s Amish might find that tradeoff stomach-able, while others might not. One reader in the know described the plain California Township group as particularly insular. A better solution to the state’s endless hankering for more money is to cut the number of ‘administrators’ on the role. Voila! Otherwise the bureaucracy will just continue its spread and more people fill state positions feeling like they need to justify their positions. It is a typical English reaction to a non problem. We have pass new laws. They should use their time and energy to clean up the drug problem in their own community. The Amish are not the problem. They are just easy targets! It takes money to build and maintain roads, bridges and transportation infrastructure. The snow plowing and mowing is not free. Everyone else has to comply with the laws and pay for using the assets. The Amish benefit from using the roads and in some cases the roads must be widened to accommodate their slow moving buggies. A lot of these costs are offset by fuel taxes that the Amish don’t pay but they still enjoy all the privileges of using the system for free. It is only fair that they should be held to the same standards as the rest of the people. I sure agree with this well stated comment. It’s about time the Amish start honoring God’s Word over tradition and legalism. They need to take to heart Romans 13:1. Thats unconstitutional so it can not happen! The right to use the public highways is a matter of right and the corporation known as the government has no right to tell anyone that they have to get a license or license plate or anything else for that matter so long as theyre not using the roads for commercial purposes. That includes cars too. So if their using theyre buggies to go to transport goods for sale or services then theyre already required to have a license and registration. Everyone has a right to use a horse and buggy or a private automobile on the public highways and byways. The only time anyone needs a license or license plate is for commercial use such as taxi or truck driver or road cop because using the roads in the course of business is a privelage not a right. I know youve been told all your life Driving is a privelage that is true because in legalese driving is a commercial term. Traveling using your automobile to get to your job going to get groceries pick up kids from school those things are rights that you dont need license or plates or insurance most people dont know that.. and the fake government wont tell you that because its a fraudulent money making scheme to keep you ignorant of your rights. Leave those Amish people alone! “Give me liberty or give me death” – Patrick Henry after seeing a man being flogged to death for refusing to get a license. Quit being tyrants and leave people alone.. this is supposed to be a free country. If theres no victim then theres no crime. Munipal Corporations violate your rights on a daily basis now they want to do this to the amish so they can enslave them too by stealing their money and property. If you just simply asked them to use rubber lining on wheels im sure they would be fine with doing that. No need to try to force it on them just ask and if they refuse then dont pave the roads they use heavily just keep dirt roads no need for asphalt itll actually save money not having to repave the road every few years. If you have a lambo then take another route to get to your destination. There are 2 classes the rulers and the slaves. The amish dont fall into either they are probably the last free people in the America. Just because your a slave doesnt mean you should make them all slaves too. Think your not a slave? Think again. Working your life away making someone else rich then you get your check thats short because the irs (unconstitutional and a corporation) steals your money before you even get it. You work at least 3 months out of the year for free just to pay taxes that you dont even really owe the irs unless you work for the government. Do you have state income? No.. Then why do you pay state income taxes? Do you have federal income? No.. Then why do you pay federal income taxes? Wages are not taxable and paying taxes to the irs is voluntary not mandatory. Im just so sick of people be ignorant wake up so we can take our government back people! Theyre our servants now somehow our servants became the masters! God created man and we dont tell Him what to do. Man created government and the government is supposed to serve us not enslave us but all you people need to wake up!